Seita Kanai: "Joint programs will become fewer and fewer." Ford-Mazda ties have changed since Ford sold its controlling stake in the Japanese automaker. • Ford representatives on Mazda board cut from 3 to 1. • Mazda, Ford pursue separate drivetrain strategies. • Ford models shift from Mazda-developed platforms to Ford platforms. TOKYO -- Less than a year after Ford Motor Co. halved its stake in Mazda Motor Corp., Mazda is embarking on a more independent product development path. Seita Kanai, head of Mazda r&d, says there will be fewer joint projects, such as the shared platforms and drivetrains that the carmakers worked on during their 30-year equity tie-up. "In terms of actual joint programs with Ford, with tangible products, that relationship has actually weakened," Kanai told Automotive News during the Tokyo Motor Show. "Joint programs will become fewer and fewer," he said. Kanai's comments offer fresh insights into how Mazda and Ford are going their separate ways now that Ford no longer holds a controlling share in its Japanese partner. In November 2008, Ford cut its stake in Mazda to 13 percent from 33 percent. Mazda promptly jettisoned two of the three Ford executives on its board to reflect Ford's diminished stake -- and influence. The Ford-Mazda partnership is cited often as an example of a successful international alliance of automakers. Ford first took an equity stake in Mazda in 1979 and brought Mazda under its control in 1996 as the Hiroshima carmaker struggled to survive. But by late last year the tables were turned, and a cash-strapped Ford sold a large part of its stake to raise capital. Cooperation helped both carmakers achieve scale but also brought friction. "Each company wants to demonstrate its own uniqueness through its own brand. So there was a conflict there," Kanai said. "It was quite laborious to decide on a single project jointly." He reaffirmed that both companies will continue to exchange information and share research findings. But the new focus will be on "softer commonality," he said. Mazda President Takashi Yamanouchi said differing engine programs highlight the divergence. While Ford pursues better fuel economy with its turbocharged EcoBoost engines, Mazda is developing its own line of Sky engines that rely mostly on direct fuel injection. Mazda does not plan to share its new engine technology with Ford. 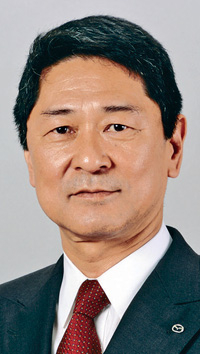 Kanai said he began discussing greater r&d independence with Ford counterpart Derrick Kuzak last year before Ford's share sale. "We are totally in agreement with each other," Kanai said. Many Ford and Mazda models share platforms, including the Fiesta and Mazda2 small cars, which ride on a platform developed by Mazda. But some Ford vehicles currently on Mazda-derived platforms are slated to shift to Ford-developed ones, including the Escape SUV and Fusion sedan. In September, Kuzak said he regularly talks with Kanai and exchanges information "within appropriate legal guidelines given the change in our financial stake." Said Kuzak: "We continue to learn constantly from each other."